The Minister of Entrepreneur Development, YB Datuk Seri Mohd Redzuan Md Yusof launched the “Fuji Xerox Smart Work Gateway for Digital Transformation, here, today. 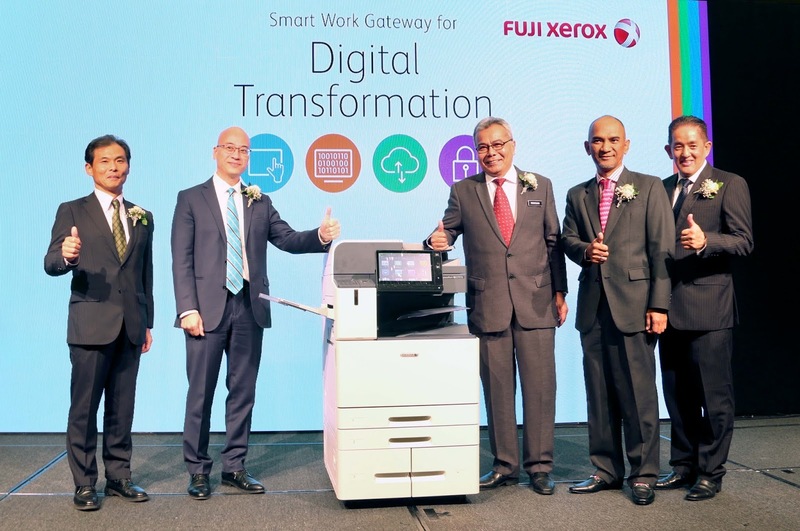 “The launch of ‘The Smart Work Gateway for Digital Transformation’ is a key step forward for Fuji Xerox to lead the evolution of digitalization technologies to Malaysian companies, especially SMEs. We look to more industry players to step forward with long-term programs that can benefit SMEs to become digitalized, and not merely computerized.” YB Datuk Seri Mohd Redzuan said. “Smart Work Gateway for Digital Transformation is our vision in supporting our customer’s Digital Transformation journey by providing them a suite of smart solution, combining our new ApeosPort-VII series of color multifunction device platform plus our solution and services for our customer to automate their work processes, digitalize business information, connect to the cloud, while ensuring end-to-end total information security throughout their business operations. 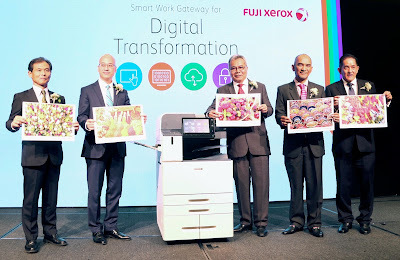 With our “Smart Work Gateway for Digital Transformation” suite of digital solution & services, we in Fuji Xerox is ready to assist & support especially the Malaysian SMEs in embracing the digitalization in their journey towards Digital Transformation,” explained Mr. Mark Tan, President of Fuji Xerox Asia Pacific Pte. 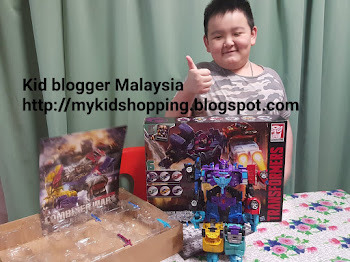 Ltd, Malaysia Operations. The ApeosPort-VII / DocuCentre-VII Color series is designed as a perfect solution for digital transformation, by making operations simple, removing technological barriers, and allowing greater flexibility to work. The entire user experience has been redefined, from its clever interactive touch screen and intelligent automated processes to its seamless integration with cloud services and security features allowing users powerful control over the creation and distribution of physical and digital documents, as well as predictive management for timely informed decision making. The esteemed guests showcasing the quality of print of the new Fuji Xerox ApeosPort and DocuCentre series. The ApeosPort-VII / DocuCentre-VII Color series combine with the suite of Fuji Xerox software and services are perfect solution for supporting any company especially SMEs embarking on digital transformation journey. It provide various unique solution for simplicity in use, quick and easy digitalization, seamless connection to cloud services, and enhanced security, to support the flexible and diversified working styles of businesses for improved performance. The success of digital transformation begins when operations are simple and that is what ApeosPort-VII / DocuCentre-VII Color Series is. A well designed large touch – screen panel and a redefined user experience with added interactive notifications through light and sound. The device can also now be operated even from mobile devices apps through Near Field Communications (NFC). * The ApeosPort-VII C / DocuCentre-VII Color series offer enhanced basic features and design for easy use. * The 10.1-inch control panel can be tapped and swiped just like a smartphone with the improved intuitive user interface. * The paper trays have an easy-to-operate retraction mechanism that allows them to be opened and closed quietly when replenishing paper. * Lights and sounds from the printer alert users about job progress and confidential documents left behind to help prevent information leakages. In digital economy, business information/data is the most important asset to any company, hence digitalization plays the most vital role in bridging the hard copy document into digital workflow. With ApeosPort-VII / DocuCentre-VII, manual indexing and handling of documents are in the past. Once a file format and destination is registered, select the workflow button and scan the document. Add a file name by adding a document type and date to a user-defined string set on a PC, great for routine work. 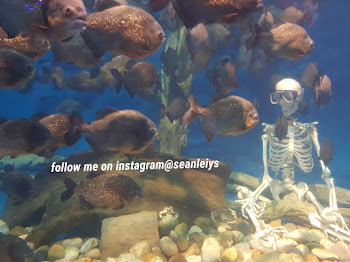 Efficiency in managing and utilizing contracts and bills, etc. is dramatically increased. With the ever evolving world of connectivity, Fuji Xerox is continuously working towards helping their customers to achieve a common vision of seamless workflow integration to overcome redundancies, reduce turnaround times and the flexibility of working anytime, anywhere. 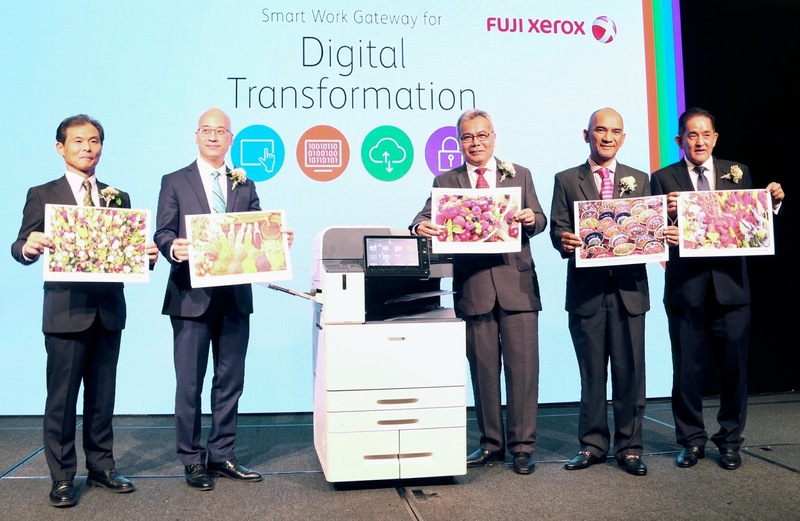 Coinciding with the launch of the ApeosPort-VII C / DocuCentre-VII Color series, Fuji Xerox has expanded its software and cloud services line-up Note 2 to help businesses work smarter. * The Cloud On-Demand Print Note 3 service allows the user to print from Fuji Xerox multifunction printers anywhere and anytime. A maximum of 3,000 printers can be used by a maximum of 30,000 registered users – especially beneficial for larger organizations. * Azure Active Directory authentication now enables interfacing with the Microsoft cloud services OneDrive for Business and SharePoint Online. * DocuWorks Tray 2 allows digital documents to be delivered through the document tray; facilitating the design of business workflows and the utilization of digital documents. * Fuji Xerox owned cloud document management service, Working Folder Note 4 now enables unregistered users to send documents – making the exchange of documents with external business partners convenient. vendors using a single interface. With the Cloud Service Hub, optical character recognition (OCR) performed when the user scans and stores a new document allows the user to search for files across several cloud storage services on the single interface. * Device Log Service is a cloud service that aggregates data about multifunction printer usage via the web. The enhanced features enable data aggregation of up to 1,500 multifunction printers and to automatically import and utilize information on LDAP/ActiveDirectory users – especially beneficial for large organizations. To comply with new international standards for data privacy and device protection, the ApeosPort-VII / DocuCentre-VII Color series offer enhanced security functions for both hardware and software with expansive network communications. Each multifunction printer can be connected to two disassociated networks, enabling the user to separate communications, delivering data security within the office. With the Trusted Platform Module (TPM) microchip and various encrypted measures, ApeosPort-VII C / DocuCentre-VII Color series provides total security against cyber-attacks in attempts to attack businesses through printing devices. On top of that, security tracking measures have also been enhanced to ensure through detailed authentication and tracking to make ApeosPort-VII / DocuCentre-VII Color series a truly secured device from all angles. The new ApeosPort-VII / DocuCentre-VII Color series incorporate a host of services that deliver key operating information such as pre-emptive alerts, usage data and required resources. These assist users mitigate downtime, maximize productivity and thus increase operating margin. Note 1: Smart Work Gateway is a concept by Fuji Xerox that leads office work to a new stage by realizing flexible and diversified working styles so that each business individual can exercise high performance. Smart Work Gateway builds a secure yet open communications environment where people can foster mutual understanding by collaborating with cloud service partners and offering various communication tools tailored to suit each need. Note 2: Check the Fuji Xerox website for information on the operating environments and models for which software and services are available. Note 3: Cloud On-Demand Print will be available from November 26, 2018. Note 4: This function for the Working Folder will be available from late November 2018.